Final post on the first part of our French odyssey. 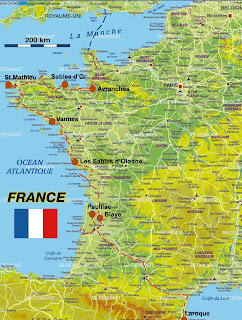 Still to come: our stay in the Auvergne with Alan and our long and winding road back to Cherbourg through the Loire Valley and Normandy. From the look of our calendar over the next week, I won't be tackling these until after we're again in France on 17 December. Back in the suitcase goes the Brittany-Normandy guide book. Our Blaye hotel is an ideal place to have Sunday breakfast, despite the cockroach a French couple interrupt as it scuttles along the floor by the buffet table. Michael has his weekly fix of bacon and eggs, while I nibble enough on a chocolate brownie to know it's properly moist and chewy. Somehow I've lost the knack of eating chocolate in the morning that I had when a teenager. Shelby Hoerger and I used to make fudge regularly for breakfast when I slept over at her house; now I can't even contemplate a pain au chocolat. Michael manages to avoid all the stalls being set up in the hotel parking lot for the flower show that is part of Les Journées du Patrimoine. The itinerary for today is even more sand-directed than usual, with Cap Ferret and the Great Dune of Pyla, the largest in Europe, our arenaceous destinations. Luckily for me, Michael has already blogged on these, so I'll simply paste in a few photos and the links to his posts. Can anyone identify this beautiful bush growing near the inevitable Cap Ferret tourist area of tacky shops and cafès? From Pyla, we drive through a resort area that could qualify as Switzerland-by-the-Sea, crammed with houses that belong on kitsch Alpine postcards. The next stop is a sop to me, the Victorian (or, more accurately given that it's French, period-of-Napoleon-III) town of Arcachon. It has been called the "Brighton of Bordeaux" and is an equally charming seaside town, purpose-built as a summer and winter (two distinct areas) getaway for the bourgeoisie. From here we head inland to the heart of Bordeaux, passing vineyard after vineyard on our way to Hôtel de France et d'Angleterre in Pauillac. Given the cost of grands crus from Pauillac en Médoc in the UK, we were expecting to feel rather shabby and out-of-place in the town. Wrong. The money from the nearby châteaux (think Rothschild) obviously doesn't trickle down. Below are some photos of the more attractive buildings we encountered, but this is a rundown place, badly in need of a facelift. The hotel food wasn't good either, so indifferent that I decided to skip breakfast the next morning and munch on some crunchy croquantes left from Brittany instead. In fairness, though, I have to say that Michael proclaimed the profiteroles in chocolate sauce the best he's ever had. He also liked the gésiers (gizzards) that I rejected from my first-course salad. We splurged on a 2005 Pauillac, Baron Nathaniel, from the Baron Phillippe de Rothschild stable, and toasted Kate and Robert's happiness, sooner rather than later. Monday, the last day of Michael's birthday tour, is dedicated to the wines of Bordeaux—and the four-hour drive home to Laroque. A sample vineyard and sample châteaux, which I think are Mouton Rothschild, Tronquoy Lalande, and Cos d'Estournel. The roses at the ends of vine rows are there, like canaries in mines, to give warning of potential problems. By now we had moved from Pauillac to Saint-Estephe, another Médoc region saturated with famous domaines. These two photos are from the town of the same name, again not as upmarket as one might expect. We're then in Saint Julien, whose wine was the unanimous favorite when Michael organized a Bordeaux blind tasting, both banks of the Gironde, for Kate and me in Dorset. The town here is small but distinctly more properous than others we'd driven through. We pause between oenological stops for a little history at another of Vauban's fortifications, this time Fort Médoc on the Gironde, built in 1690 primarily to defend the Bordeaux area against the nefarious British by closing the estuary. Fort Médoc was never tested, but Vauban's installation at Blaye, the centerpiece of his three-part defense system (there's also Fort Pâté on an island in the middle of the river), was attacked by the British in 1814; their siege lasted ten days and was ended not by local capitulation but by the abdication of Napoleon. Back on the wine route after this, heading for Moulis (final s pronounced), which Michael has decided is the place he most wants to stop for a tasting to add a few more bottles of Médoc to those we pick up at a local Carrefour. We find the Château Granins Grand Poujeaux salle de dégustation a bit more easily than we had tracked down Fort Médoc—neither was adequately signed in advance—and this too was well worth the hunt. We leave the friendly proprietress with seven bottles of wine and a set of chaussettes de vins (wine socks), each decorated with a question mark, to fit over bottles for blind tastings. Au revoir, Bordeaux! Four hours of motorway, broken by our usual picnic lunch—at a table for once, in one of the offroad aires the French do so well—and we're back home. Below is Michael's sand collection, drying and later in bags, and my pebbles in the stone planter built into the wall on our patio. Quite a birthday trip.